If filing for an uncontested divorce in East Baton Rouge Parish, Louisiana, there are several different ways to file. This article discusses the form to be filed by an attorney once you and your spouse have reached an agreement regarding all aspects of their separation which you wish for a judge to approve. 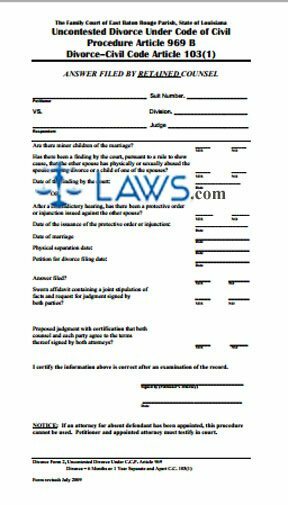 The form can be obtained from the website maintained by the East Baton Rouge Parish Family Court and must be completed by an attorney. Louisiana Uncontested Divorce Under Code Of Civil Procedure Article 969 B 2 Step 1: The attorney should enter the name of both parties, the suit number, the division number of the court, and the name of the presiding judge. Louisiana Uncontested Divorce Under Code Of Civil Procedure Article 969 B 2 Step 3: The second question asks if a court has ever found that one spouse abused the other. If so, include the date of the ruling. Note if there has been any protection order in effect, and include the date it was issued. Louisiana Uncontested Divorce Under Code Of Civil Procedure Article 969 B 2 Step 4: Note the date of the marriage where indicated. Louisiana Uncontested Divorce Under Code Of Civil Procedure Article 969 B 2 Step 5: Note the date on which the couple began living separately. Louisiana Uncontested Divorce Under Code Of Civil Procedure Article 969 B 2 Step 6: Enter the date on which the petition for divorce was filed. Louisiana Uncontested Divorce Under Code Of Civil Procedure Article 969 B 2 Step 7: Check "yes" or "no" on the line asking if the spouse filed a response. Louisiana Uncontested Divorce Under Code Of Civil Procedure Article 969 B 2 Step 8: Indicate yes or no as to whether there is either a sworn affidavit containing all relevant facts and a request for proposed judgment or a certified judgment signed by both parties' lawyers. Louisiana Uncontested Divorce Under Code Of Civil Procedure Article 969 B 2 Step 9: The attorney should sign and date the form.